If you look at Chelsey Fix ’19, smiling at the center of a recent photo with the University of Lynchburg Debate and Forensics Society, the first thing that comes to mind is definitely not Jim Jones, the infamous cult leader who initiated the mass suicide of more than 900 of his followers in Jonestown, Guyana, in 1978. Fix and other members of Lynchburg’s Debate and Forensics Society were in North Carolina February 16 and 17 for a tournament hosted by the Collegiate Forensic Association. Lynchburg, which has had debate and forensics for only four years, competed and placed in several categories and placed fourth overall. In addition to her first in Declamation, Fix also placed first in After Dinner Speaking, an event Cummings describes as “a mix of serious topic and humorous delivery.” For this event, competitors write original speeches. Fix’s speech, for example, was about endangered ducks. 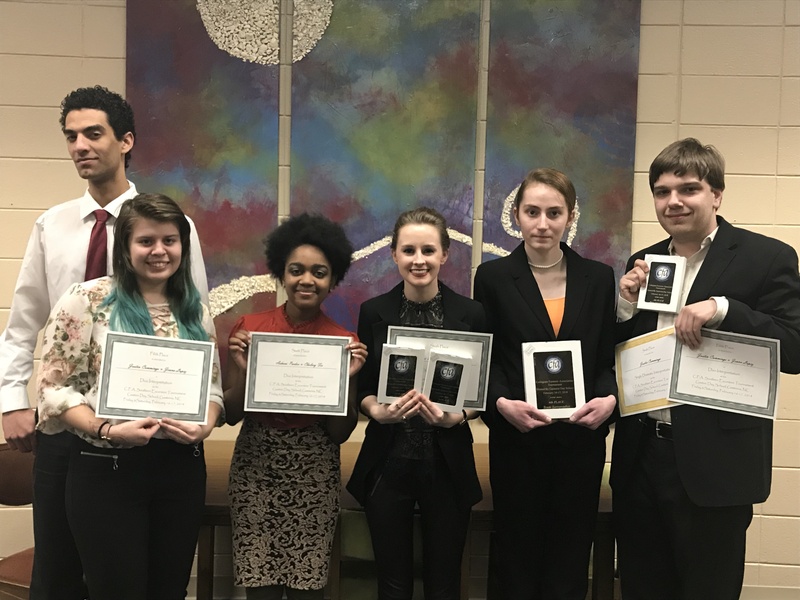 Lynchburg’s Debate and Forensics Society consists of (left to right) Ethan Fredericks ’21, Jenna Lopez ’21, Ashani Parker ’21, Chelsey Fix ’19, Rhiannon Cire ’19, and Justin Cummings ’19.